A quick check of the Resonance FM holiday schedules reveals that the last episode in the original Welcome to Mars radio series is being broadcast by them on Christmas Day at 9.30 in the evening. There will not be a repeat broadcast, so if you don’t want to miss it, this is the time to tune in. Alternatively, you can follow the link on sound designer Simon James’s website and download it as a podcast. As the calendar of forthcoming events on this blog is regularly being updated, it’s probably not a bad idea to subscribe to the RSS feed, saving you the trouble of constantly checking in. There are worse things to find cluttering up your inbox during 2009. Andrew Stevens of 3:AM Magazine and editor of the 3:AM London-New York-Paris anthology has just posted a fairly extensive interview with me on the 3:AM website. Developed out of a regular exchange of emails between Andrew and myself over the past few weeks ‘Everyone Should Have Their Own Factory Catalogue Number...’ covers everything from my early days with Biting Tongues to the publication of Destroy All Monsters and the thinking behind Welcome to Mars. During the first two or three questions I was prepared to accept the email interview as the digital extension of a spontaneous speech act, but by the sixth or seventh question I was not so certain anymore. This is a fascinating form of exchange that requires further thought and exploration. Whatever is going on here shouldn’t be taken lightly. Who or what, for example, is actually speaking in an email interview? 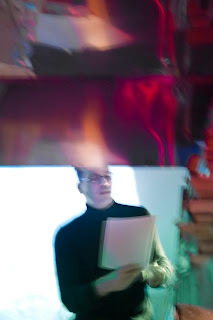 The image at the top of this post was taken by Simon Tyszko during my recent reading at Phlight. See the previous post for more details. The final live event scheduled for 2008 was a reading at Phlight before a very select audience of invited guests on the night of December 17. It’s a small space but an ideal one for an intimate evening. Simon Tyszko made me comfortable on an improvised stool and arranged for a small lamp to be carefully positioned right behind me by the kitchen sink, where a makeshift lectern had been set up. My reading was from Welcome to Mars with an audiovisual accompaniment on DVD, featuring the electronic tonalities of Simon James and montage by Bruce Woolley, very similar to the one presented at the Other Cinema in San Francisco back in September. 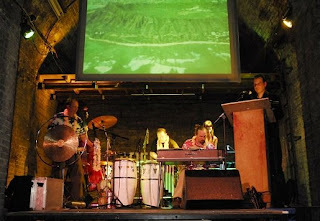 A video projector had been set up on top of the Dakota wing, above the audience's heads; and the screen itself was a magnificently crumpled expanse of ship's sail, the right-hand corner of which was held in place with a powerful magnet extracted, Simon told me, from an old Mac hard drive. David Ellis was busy in the background, documenting the entire reading on video for a future post of the Phlight website, while Kitty Keen was on hand to take a few pictures. Through the vertical windows above, we can consequently see, under the majestic shadow of the wing: NORAD warning, the audience warming, Starman flying and Thelma Tadlock dancing. It was truly a memorable night. My thanks to everyone who took part. And before the weeping love goddesses and adoring cupids have even had a chance to dry their eyes, the death in hospital at age 85 has been announced of the fabulous Bettie Page. The obituary writers at the LA Times seem to be working overtime for the Holidays. From ‘1957 Contact With Space’ in Welcome to Mars. And yet that smile of hers will remain forever with us: unfathomable, unreadable and magnificently innocent. Happy Christmas, Bettie. The death was announced last week of Forrest J Ackerman - the man who brought Famous Monsters of Filmland into the world, shared his Tinsel Town mini-mansion with Kenneth Anger, worked as L Ron Hubbard ’s literary agent on the West Coast and represented low-budget special effects man Paul Blaisdell in Hollywood. 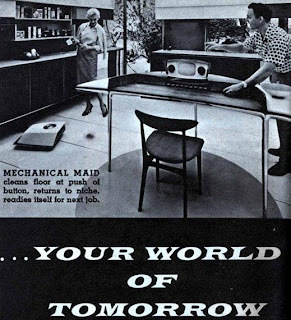 It was Ackerman, according to his obituary in the LA Times who first coined the term ‘sci-fi’ back in 1954, inspired by the craze for high-fidelity sweeping the nation that year. Although the public’s fascination with hi-fi is documented in the chapter in Welcome to Mars dedicated to the events of 1954, I would have liked to include this new piece of information in the passage exploring the connection between hi-fi in the home and the music playing over the sound system aboard the nuclear submarine in the giant monster movie It Came From Beneath The Sea. Ackerman was also present at the Dianetics Rally at the Shrine Auditorium LA in August 1950 where over 750 non-professional Dianetics groups met in one of the movement’s biggest public displays. His collection of science-fiction posters, props and related movie ephemera is unrivalled; the enthusiasm he showed for the subject throughout his life was without equal. The future will never be the same without him. How can you be in a non-place when you’re actually moving from Landside to Airside, connecting two major elements together simply by riding an escalator? Probably when all you’re doing is following the signs and the flow of passengers from one location to the other. Completed in 2005, the design of Zurich Airport’s Fifth Expansion makes a great use of natural daylight and views of the surrounding area. Personally I was more impressed by having four Swiss International check-in staff gathered around one of the new machines, showing me how to process my own boarding card and label my baggage. I guess it must have been a quiet day. The unregistered transition from Landside, where the main rail transport hub is located, to the Airside, where arrivals and departures flow through the same extended concourse, reminds me once again that in airports, hotels, supermarkets and shopping malls, the figure in transit is the primary location: everything else is just a fixed point by which to organize yourself. You become the focal point of a non-place – if only by default. I love the peace and suspension of an airport departure lounge and welcome the time I get to spend in such a spectacularly featureless space. On the de-territorialized frontier of the airport you can pay closer attention to your responses. At home people tend to forget themselves: everything is too familiar a reminder of who you are. The focussed minimalism of the airport highlights everything from displays of confectionary, alcohol magazine, pens and watches to the sudden appearance of a sports car (however do they get it there?) for promotional purposes. This seems an appropriate post after the visit to Phlight last week – from the very local to the spectacularly non-existent. Such elaborate conceptual engineering is impressive on any scale, however. Airside may only offer landscape views of airplane wings but it's courtesy of its custom louvred shading system which extends the full length of the building’s facade, offering a continuous view of the airfield while automatically adjusting itself to climatic conditions. I also enjoyed the visual theme of bioluminescent deep-sea creatures swirling around the curved walls of the Internet Point – particularly the accompanying note about some fish using their own light as a ‘sniper scope’ to illuminate their prey with a red light only they can see – plus the regular open wells of visual space connecting one level of the concourse with the other – making it hard to feel that you’re lost even if you still don’t quite know where you are. He’s right of course. Taking a decent photograph of Phlight isn’t easy, so I fell back on an old trick I once learned from Andy Peters for photographing hot rods and dragsters: concentrate on one tiny detail and get that to represent the whole. Suddenly all the neat of lines rivets lovingly punched into place took on a strength all of their own. Having seen some of the footage taken of the wing’s manufacture, I can testify that this isn’t a mocked-up replica of a Dakota wing: it’s a Dakota wing. With every strut, brace, section and support in place, it’s an amazing piece of engineering in itself; and that’s before we get to the logistical problems of wedging it into a post-war South London council flat. What’s equally remarkable about the relationship between the wing and the domestic space it occupies is the way in which Simon’s flat still divides itself up into habitable areas but does so by horizontal divisions: a flat wide plane separates the kitchen from his work area, the books are all arranged on their sides filling every conceivable free opening, while the bathroom, exposed to the entire room and far from the wing, offers the best view of it by far. I was taken to Phlight by rogue enthusiast David Ellis, who is making a film about the wing's creation and its installation. On the way we stopped by the UK headquarters of the Aetherius Society, founded by taxi driver George King in London in 1958 but now with its main base located in Los Angeles. George King had a series of revelations in 1954 which led him to have direct spiritual contact with the Space Brothers; and for many years the front of the UK office, still based on the Fulham Road, used to have the cheeriest neon flying saucer hanging over the door. Sadly it’s now disappeared, as have all the pictures of flying saucers, shown whole and in section, which used to grace their window displays. Very similar to the flying saucer photographed by George Adamski back in the 1950s, their display was always a reassuring reminder that spiritual advancement and technological progress were still linked together in some people's minds, and that a prayer battery was still being charged in the Aetherius Society basement. Unfortunately, one of the society members, who caught David filming me outside the shop window in full flow about 1950s saucer cults, took a slightly dim view of my enthusiasm for their work and declined to give us an interview – even though we hadn’t actually asked her to grant us one. The rest of the evening was spent under the wing, making plans for me to do a reading from ‘Welcome to Mars’ there sometime later this month. I will be presenting an intimate version of the Other Cinema reading to an invited audience beneath the wing and then engaging Simon in conversation about aerospace, art and the future from the wing itself. It should be a most engaging evening. Above: two views of the wing with an open fire beneath it and neon tubes above; a close-up of the rivets and; finally, Simon makes tea on the far side of the wing while Ellis gazes into the flames. Antoine de Saint Exupéry would surely have approved. I spent a remarkably stimulating day last week with a group of Communication Design students at the Hochschule der Künste Bern in Switzerland. After delivering a talk, ‘Information As Art Form’, which outlined the development of my work as a writer and looked at some of the themes and ideas explored in ‘Welcome to Mars’, I was invited to lead the students in an afternoon workshop. Joining in with the running of the exercise was Axel Vogelsang from the Lucerne University of Sciences and the Arts. Together we distributed a number of journals and magazines selected from the school’s basement library and distributed them at random among the students. They were then given exactly 20 minutes to find some fragment of text or isolated image that referenced in some way the concept of ‘science fiction’ – what it might mean in terms of identifiable shifts in thinking, altered attitudes towards history, progress, technology and nature, the body etc. The students’ discoveries were then transformed into a network of key ideas and terms, worked out in a group seminar using a whiteboard and post-it notes. The first text proposed by a student to go up on the board set the tone for what was to come: ‘The first quality required of a prophet is a good memory.' What followed was an intense two hours of spirited debate and exposition. Axel’s penmanship was considerably better than mine, which helps to explain the particularly graceful arrangement of ideas in the photographs displayed above. The picture of Axel addressing the whiteboard gives an accurate indication of the overall intensity of the session. My admiration, however, is entirely for the students, who helped generate the network of ideas. Thank you all for such an inspiring exchange. One of the things I particularly loved about the Bern Hochschule was its ultramodern completely unfinished nature: the walls of raw concrete and plaster, the glistening lines of exposed heating ducts and naked track wiring. Everyone seemed so perfectly at home in this permanently hopeful environment, so it seemed entirely appropriate that we should have left behind only a temporary network of nodes and links fashioned out of marker-pen ink and post-its. These pictures are all that now remain of it. Weird radio signals from Venus, psychic driving and America’s first atomic powered singer. Bring a doctor. 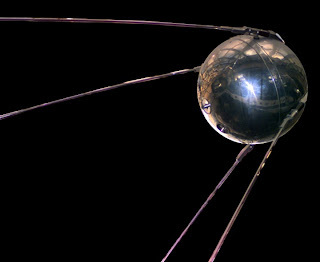 That ain’t rock n roll, it’s Sputnik! Von Braun gets it right, UFO sightings reach their peak, and Bela Lugosi lives again! Bring a doctor. Weird scenes from the Spook Pit, inside Eisenhower’s atomic bunker, and whatever happened to Leika the Space Dog? History like it’s never been before! These shows can be heard on 104.4 FM or live stream direct from Resonance 104.4 FM. The fourth lecture in the Bright Labyrinth series deals with themes of ecstasy and excess and the impossibility of communicating such experiences in any rational or lucid form, least of all in an age of digital media. It will approach this problem historically by making connections between the writings of Georges Bataille, the Marquis de Sade, Saint Theresa of Avila and the St John of the Cross, seeing in their attempts to illuminate such extreme experiences as agony and ecstasy a struggle to maintain individual consciousness at the precise moment when identity itself is at its most vulnerable and threatened. 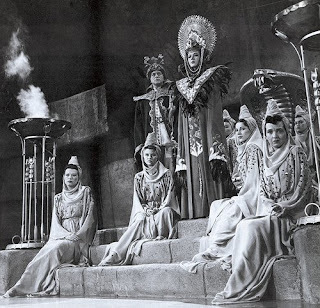 The result is often delirium and paradox, within which we find a far darker truth residing: one that animates the Dionysian rituals of Vienna Actionist Herman Nitsch and the adolescent sadomasochistic fantasies of Kenneth Anger’s first film ‘Fireworks’. Can such images of madness and violent excess survive into the digital regime, where identity seems to be of the highest importance, or will their meaning inevitably be changed? And, if this is so, are we in danger of leaving our bodies – hardened and hollowed out by liposuction, keyhole surgery and implants – far behind us? Or will the work of Franko B and Orlan take us into the future by connecting this new flesh with some very old rites? For more information on the Vienna Actionists and archive footage of their often extreme performances, click here. To get a preview of Kenneth Anger’s ‘Fireworks’ click here. To remind yourself of how 'Un Chien Andalou' by Salvador Dali and Luis Bunuel begins, click here. Please be advised that the content of this lecture will not in any way be pretty. 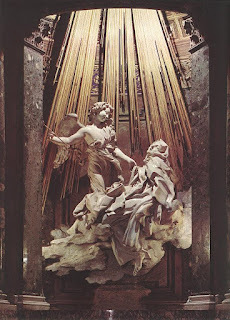 Top image: 'The Ecstasy of St Teresa' by Bernini. Lecture 4, MACD 2.00pm Wednesday, December 3, see Google Calendar for details.